Ultrasound is a medical imaging technique that uses high frequency sound waves emitted and received by a probe to generate an image. 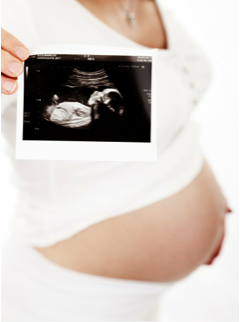 Ultrasound is noninvasive and an important tool in prenatal diagnosis for the detection of a variety of abnormalities. 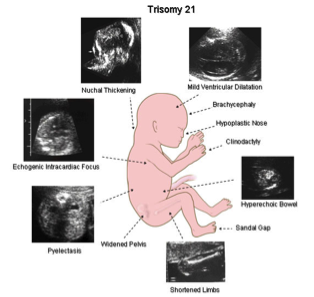 For example, between the 11th and 14th weeks of pregnancy, ultrasound can be used to perform the nuchal translucency (NT) screening test. During the procedure, an ultrasound technician measures the clear space (nuchal fold) at the base of the developing neck. A normal nuchal fold measurement is usually less than 2.5 mm. If the measurement is greater than 2.5 mm, it may indicate a chromosomal abnormality such as Down syndrome. Typically, ultrasound findings are combined with the results of blood tests to determine if more invasive testing, like amniocentesis, is warranted. These blood tests measure the levels of particular proteins in the mother’s blood. Abnormally high or low levels can indicate a problem. Two such proteins are PAPP-A (pregnancy-associated plasma protein-A), which is produced by the placenta in early pregnancy, and AFP (alpha-fetoprotein), which is produced by the liver and yolk sac of the developing fetus. Additionally, hormones produced by the placenta and fetus are released into the maternal blood stream. These hormones include hCG, estriol, and inhibin and are also useful in indicating chromosomal anomalies in early development. However, an abnormal protein or hormone marker is not considered conclusive evidence of an abnormality. The findings from the protein screenings are combined with nuchal translucency results to produce a risk calculation (i.e. 1 in 300 risk for Down Syndrome).